Ian Farrier’s plans provide for a very strong daggerboard trunk that extends all the way through the boat from the deck to the bottom of the hull. The rectangular head of the board fits snugly inside the rectangular trunk, holding the dagger steady under sail. But what happens when the dagger strikes an underwater object? Ian designed in a weak point into most of his board’s plans, ie they shear off at the hull line rather than rip apart the trunks from the force of the blow. Now go back a few posts to trimaran Skateaway. Keith designed in a big wedge behind the daggerboard, sitting inside the trunk, that acts as a shock absorbing bumper. I think it’s about 5″ fore/aft at the bottom, and tapers going up. He claims that in 20 years of hard sailing in shoal areas where groundings are common, the system has worked flawlessly in protecting both the board and trunk. That’s four layers of 12oz biax glass to form a trunk-length strip for holding the shock absorbers. We had ordered a 6″x6″x3″ block of neoprene rubber (60 durometer) from McMaster. (Forget that 10% tolerance on the website; this thing was dead-on the advertised 3″ wide). Tablesaw literally burned rubber like an American Graffiti outtake. These relief holes are a key part of the shock absorption. 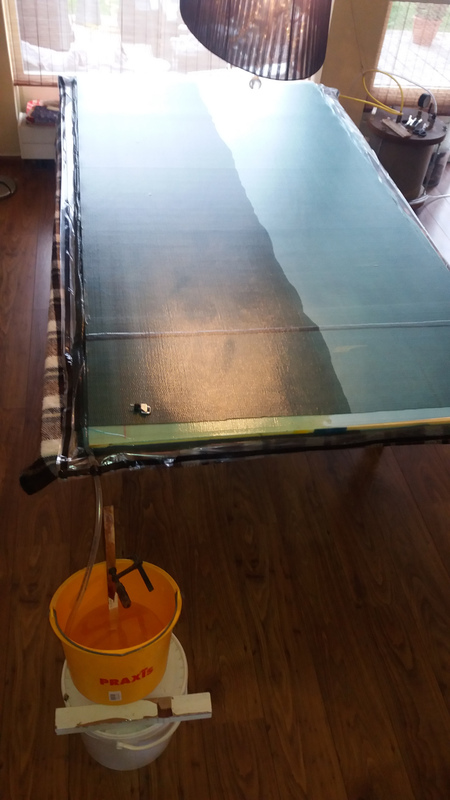 The rubber is heavy and expensive, so we compromised to this amount which will protect the board from about 2/3 deployed through fully deployed. Further up in the case the bumper is backed by wood blocks, ie what we had on hand. It slid just right down the trunk, behind the dagger, glass side out. The black plastic plate is affixed to the bumper, and the plate simply screwed in to the upper rim of the trunk. From the bottom looking up, you can see the lowest rubber bumper and the glass plate behind the dagger. The dagger exit slot is about 2″ too long now. We didn’t have time in this haul out to fill in the gaps. Maybe next time, for max underwater efficiency. Don’t worry that the board looks off center in the photo. It was being forced to one side at the time. So, to you F-boat plan holding builders out there, I challenge you: Ian’s not here to debate it with us, but why not make room for a bumper in your dagger trunk? The auto industry figured this out in the 70’s. At least we can hide ours. Make your case two inches bigger? Reshape your dagger to get a 9:1 aspect ratio. Ian designed the F36/39 board too long fore/aft for its width. Today’s foils have proved it. So perhaps fill the rest of that case with this idea! Back when we launched Ravenswing, Charlie made an excellent CrazyCrane in the back of his pickup to help us get the floats into position on the beams. This time we needed a way to get the dagger up and down a couple dozen times for all this retrofit work. We’ll just call this one DingleDerrick. I asked the yard boss to just leave the huge crane over the boat for the weekend. But he said no, there’s no boom brake and the wind is being weird lately. So they craned up two hideous old horses on deck and pointed me to the woodpile. Got to love the DIY boat yard. They even let me play with the gas powered pressure washer, and the boat bottom got blasted clean. The above shot has the dodger in its new top-sides matching grey. Warning here to never use the one part Interlux Brightsides paint for mixing bright colors. Our 1/2 yellow, 1/2 red Ravenswing Orange faded severely after just one summer. Those smiles were a pretty good recovery from what we found upon entering the cabin that day. This entry was posted in Foils, Paint & Finishes by cartersboat. Bookmark the permalink. 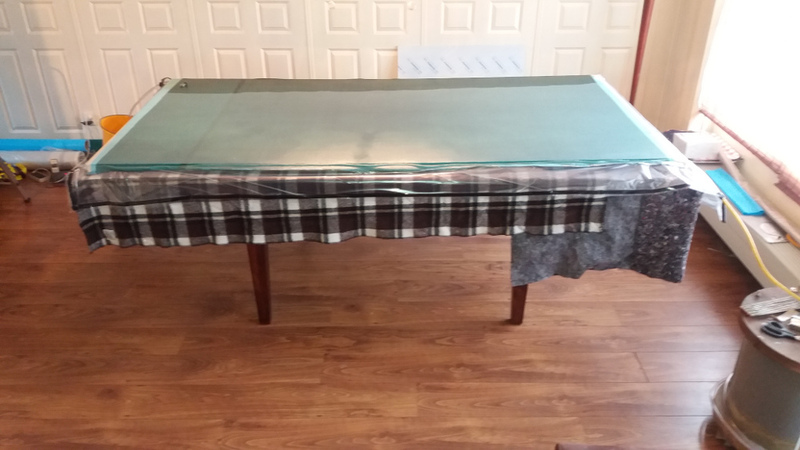 For the larger parts like cutting the glassfiber fabric or vacuum infusing the 4″x8″ sheets I move the work to the dining table in the living room. Yes, I do very much look forward to meeting your family some day soon.